It has been a while since I last posted, and if you don't want to read a clumsy preamble about my personal life, feel free to scroll straight down to the recipe. Go on, I'll never know. I've had some pretty major life changes occur over the last few months, and things have been internally and externally extremely unstable for me. I feel as though I've spent recent months gnawing on imaginary tethers before I finally turned the lights on and realised I was, in fact, free this entire time. Life is interesting. And beautiful. And surprising. Although I always make a big effort to continue to nurture myself and eat well; making beautiful, home-cooked meals did fall by the wayside somewhat in recent times due to my being so unsettled. Recently I have been making absolute basics most of the time and did not create anything worthy of a Famished Fox post! Now I am settled in my new home in Bondi Beach, living with an absolutely gorgeous flatmate who I met studying Naturopathy. We both like to cook deliciously healthy meals, frolic gracelessly in the sea, train hard, drink wine by the bucket, and make fun of silly boys. We're a good match. Through all of the recent tumult, I have really had my eyes opened to the quality and beauty of the people around me and I am wholly and joyfully grateful for the amazing support network I have. I must be the luckiest woman alive. 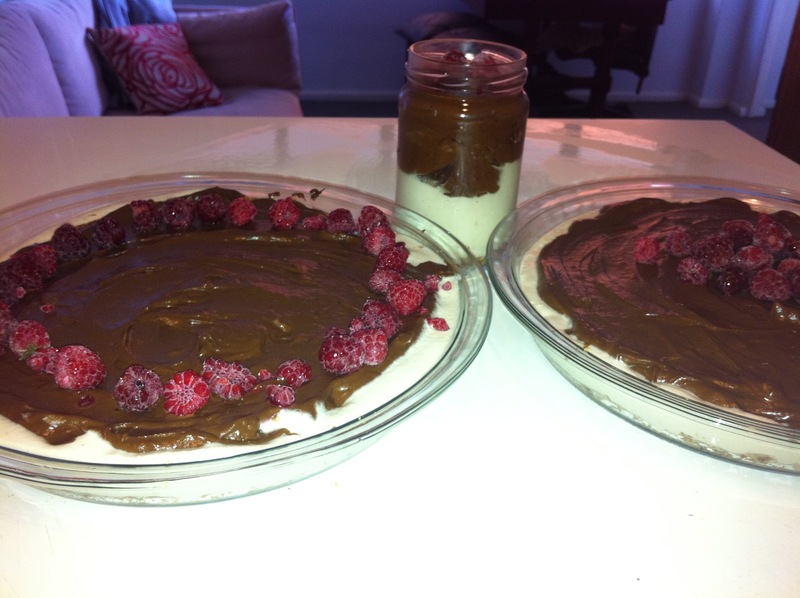 So, I decided to get (raw) cooking and make my famous Raw Triple Layer Cheesecake and Chocolate Mousse Pie for some very deserving friends. Heather. Fereen. Sean. Kylie. Eat the food, y'all. You've earned it. Now back to the pie... this pie is legitimately ridiculous. 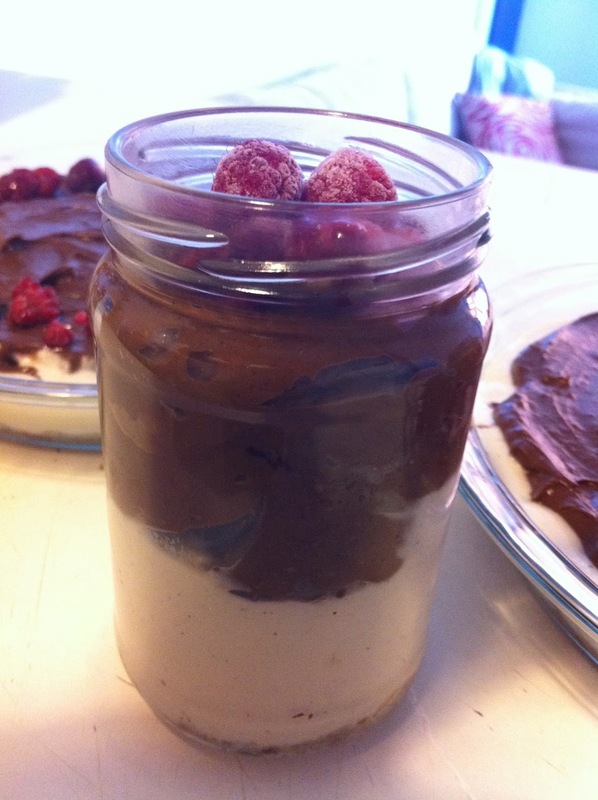 I have never made this dessert for someone who didn't love it. This list includes teenagers, little kids, stubborn parents, and health-suspicious friends. This recipe is a FF original and is jam-packed with antioxidants, good fatty acids, protein, enzymes, minerals, and a good range of both water and fat soluble vitamins. Blend all of the ingredients for the base in a food processor until it just starts to come together but still has some texture to it, and then press into the base of the pie tins and jars. Blend all of the ingredients for the cashew cheesecake layer and layer over the almond base. Refrigerate or freeze while you process the ingredients for the mousse so that it is more firm and easier to layer the mousse on top of the cheesecake layer. Decorate at will, and eat the whole thing in like, 12 hours. That's what we all did. Stay tuned for some exciting news, foxes. It feels good to be back.